This is a multi-media piece called “Uncle Sam.” Uncle Sam is the name of the little locomotive in the picture. I made a print of my original pen and ink onto 140 lbs watercolor paper. I expanded and enhanced the print with additional pen and ink. Next I did a two-tone watercolor painting with sepia and raw umber. 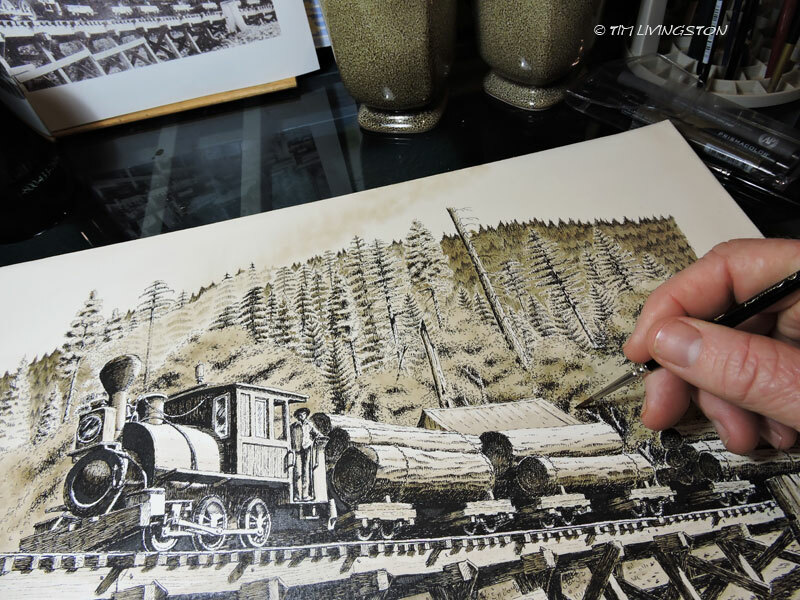 The goal is to create an original piece reminiscent of an old sepia tone photograph. Both pieces are being framed right now. Stay tuned for our final pieces! The view of the art table with one of the spreads in progress. These were all that’s left to do. All have been started. Mary stretched and mounted them all for me, while I was painting. It’s good to have people! Working multiple illustrations at the same time is a very efficient way to get these done. By Sunday night I had completed two more spreads. This is the view out my window at my painting table, while I work. Not bad. The inking is complete and I’ve been painting furiously. I taken some vacation time to complete this project. Today I was painting the chipper scene. I posted about that one before. I couldn’t decide which picture to post, so here’s another. 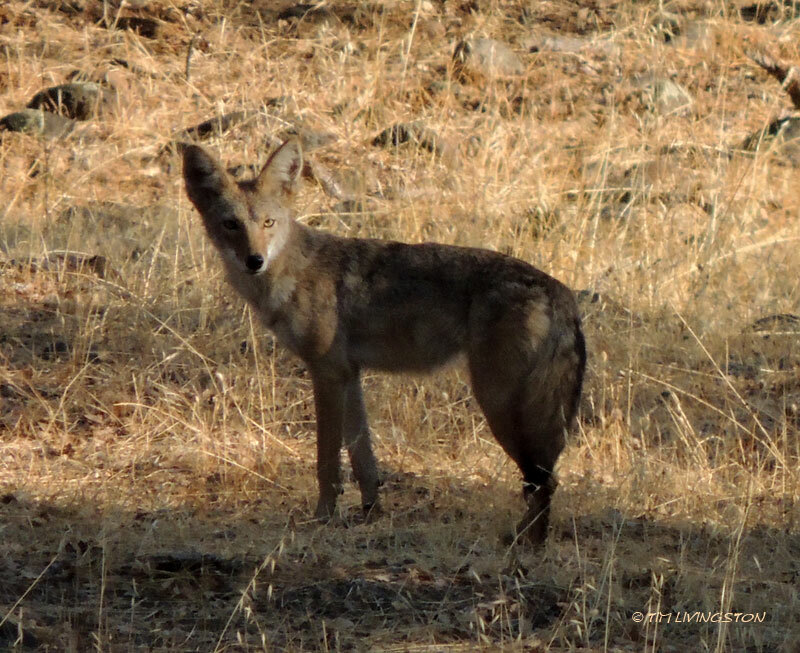 Wild Wednesday … Wiley Coyote? Wild as in wildlife. Naturally, the coyote comes after the roadrunner. I enjoy seeing wild coyotes and I see them often. As a dog lover, I’m sympathetic toward them. On the flip side I have no illusions about their predator nature and I keep an eye out for our pets and livestock. This coyote was just west of the house. She came cruising through and posed very politely. Ranchers have to protect their livestock because it’s their livelihood. 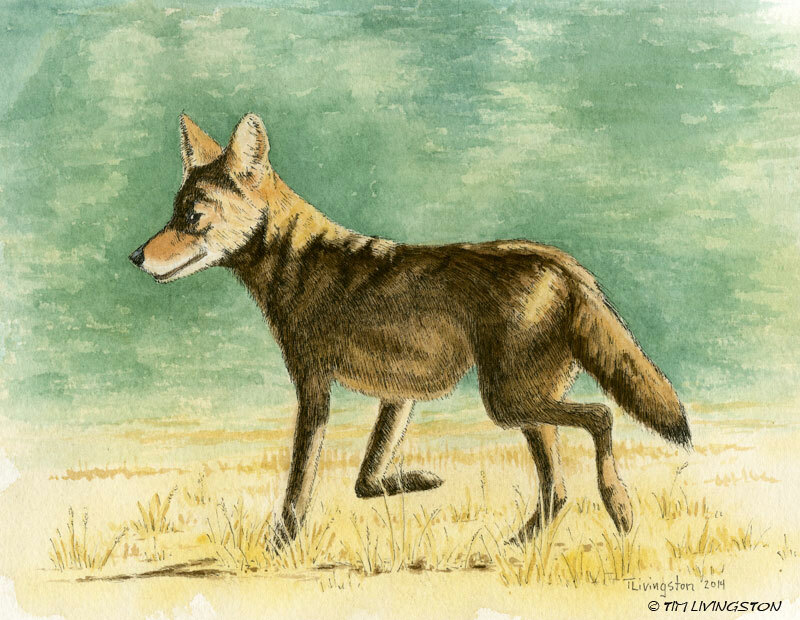 Coyotes have to hunt because it’s their livelihood. 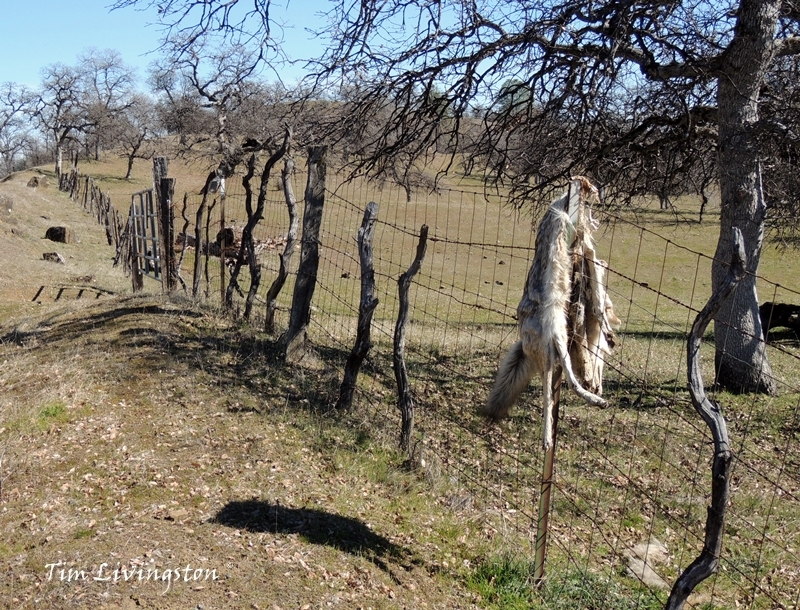 It’s a tough reality for coyotes and ranchers alike. All part of the harsh balance of nature. It’s tough being a coyote. 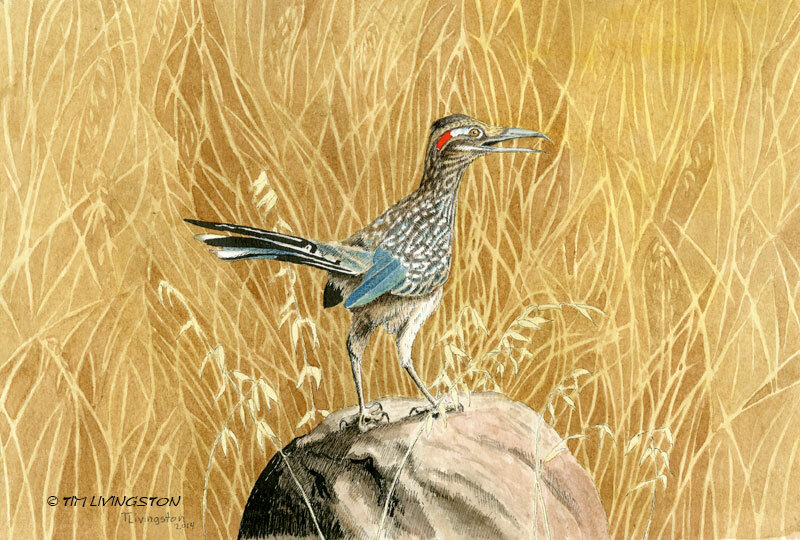 Roadrunner, the Coyote’s After You! Here’s my inspiration. I don’t see them often, and what a treat to have a photogenic roadrunner! It’s day five! I was tagged to do the 3 pieces of art a day for 5 days, Art Challenge, by Mark Mitchell. This is the last post. The theme for today is “Story Books”, that I’ve illustrated I put up illustrations from three different books. I would love to give everyone a break, so I’m not tagging anybody for the Art Challenge. If you want to do it, then tell me and I’ll tag you! It’s day four! I was tagged to do the 3 pieces of art a day for 5 days, Art Challenge, by Mark Mitchell. Hey Mark, this is starting to feel like homework. The theme for today is “Fur, Fins and Feathers.” I put up something old and something new. I would love to see Ruth of Ruth’s Artwork do the Art Challenge. 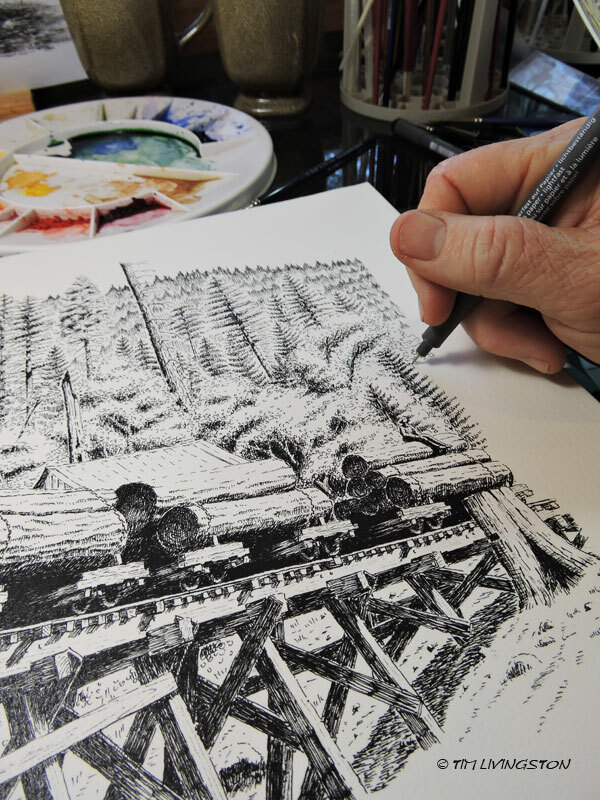 I picked Ruth because of her amazing pen and ink/watercolor, mixed media, architectural illustrations. She also does wonderful animals. She does lots of fantastic commissions. I recommend you check out her site. The “Uncle Sam”, hauling logs in the Sierra Nevada. Skidding logs with a big wheels and a team. It’s day three! I was tagged to do the 3 pieces of art a day for 5 days, Art Challenge, by Mark Mitchell. The theme for today is “Old Time Logging.” I threw in a bonus picture that you may recognize from my banner. It was used for a book cover, but it makes a good banner too. I would love to see Annerose Georgeson do the Art Challenge. I picked Annerose because of her wonderful impressionistic paintings of nature and forestry subjects. It seems like a good match to me. A window to the woods. It’s day two! I was tagged to do the 3 pieces of art a day for 5 days, Art Challenge, by Mark Mitchell. The theme for today is “En Plein Aire.” The nuthatch is my first and only plein aire watercolor painting. Perhaps there will be more someday. The others were done over lunch while making my rounds in the woods. Just a tiny snapshots of my days. Pens are so much more portable than watercolors. I would love to see Mary at oilpastelsbymary to do the Art Challenge. This challenge originated on Facebook, but I have moved it over to WordPress. Please check it out my new Facebook page at Tim Livingston. Today is day one! I was tagged to do the 3 pieces of art a day for 5 days, Art Challenge, by Mark Mitchell. The theme for today is dogs. I bet you didn’t see that coming! Tessa is the watercolor, Hunter in pen and ink, and Blitz in mixed media. These are all dogs that Mary and I have raised. For that reason I challenge MaryA Livingston to the Art Challenge. This challenge originated on Facebook, but I have moved it over to WordPress. Incidentally, it was my first post on my brand new Facebook page, Tim Livingston on Facebook. Please check it out.